Johnny Depp y Keith Richards están en la portada de la nueva edición de la Revista Rolling Stone. I love Johnny Depp!! Keith Richards hará de Padre de Johnny, en la nueva película de Pirates of the Caribbean: At World's End. Richards será el Capitan Teague, padre de Sparrow, en esta tercera entrega. Yo amo a Johnny (ya dije eso?) y su papel del Capitan Sparrow, lo cómico es que Keith no me agrada, y Johnny se inspiró en él para darle vida al loco Capitán, Funny, huh? Awww quiero ver esta película!! 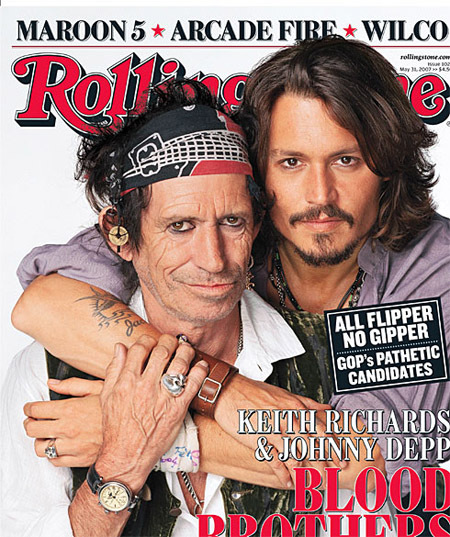 // Johnny Depp and Keith Richards are in the cover of Rolling Stone new issue. I love Johnny and her character of Captain Sparrow. The funny thing I don't Like Keith Richard and Johnny said he drew inspiration for loopy pirate king Jack Sparrow from Richards. Keith Richards agreed to play Sparrow's father, Captain Teague, in Pirates of the Caribbean: At World's End. Oooh! I want to see this movie now! !